Higher education expert and website consultant Mark Greenfield posted “How Good is Good Enough?” on his blog in June, posing the question to the higher education community. We shared his post on social media, and ever since I’ve been asking myself the same question. As a content person, having relevant, accurate, error-free content means everything to me. And if it doesn’t already, it is starting to mean everything to your web visitors too (hint: it should mean everything to you as well). Not caring about the quality of your website and content can have devastating consequences – because one minor mistake might look like a big mistake to your boss, customers, or web visitors. The problem with accepting your website as “good enough” is that websites are so much more than they used to be – they are no longer just a place to find a phone number, an address, or learn a little bit more by reading those oh-so-interesting FAQs. Your website is literally the face of your organization. Web visitors want to find information on their own and learn as much about you as they possibly can without having to pick up a phone. That’s why websites, their functionality, and content are so important. Your website can make or break you. And while I wish I was exaggerating this point, I’m not! Now there is a major difference between being perfect and good enough, and like most things in life, a website will never be perfect. But by putting the same time and energy into your website as you do other projects, you will ensure you’re reaching new visitors, while giving your returning visitors and loyal customers the best user experience possible. Imagine your own experience trying to find information online and then ending up on an error page. It isn’t pleasant, and how often do you click out of a website if you come across one or more broken links? Almost always, right? While most people can ignore a misspelling here and there (hey, it happens), too many can take away the credibility of an organization. It looks sloppy and people begin to question if the organization cares. Showing that you care about communicating to your visitors (in an error-free manner) shows that you care about your organization, your work, and your visitors. Consistency matters for a number of reasons, but arguably the most important reason is branding. You want to maintain a certain voice and image across all of your content, which includes names, capitalization, registered trademarks, phrases, and so much more. Aside from the fact it is morally responsible to ensure information is accessible to everyone, making your website accessible helps enhance your SEO efforts and overall makes your website easier to use and navigate. It's time to embrace the challenge of accessibility. Whether you are trying to attract new customers, visitors, students, patients, or clients, search engine traffic matters. Search engine traffic can attract new visitors and provide valuable ROI. Why do you think so many companies spend thousands on Google AdWords every month? They want to show up in relevant searches and reach the appropriate audiences. You don’t want to be the last to know that your website is down or something isn’t working. No matter what information you share, you don’t want to frustrate visitors who can’t access your website to get the information they need. So all in all – it all matters. And that’s why good enough is not good enough. 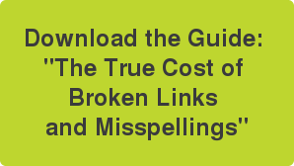 For more information on effective website management, download our web guide "The True Cost of Website Broken Links and Misspellings."